YMag is bridging the gap between where women are at and where they want to be. We talk to Editor-in-Chief Shar Moore to find out more about how YMag aims to empower women. Can you describe YMag magazine ? Who is it for and what is its mission? entrepreneur and realizing their own Y. What does YMag look and feel like ? 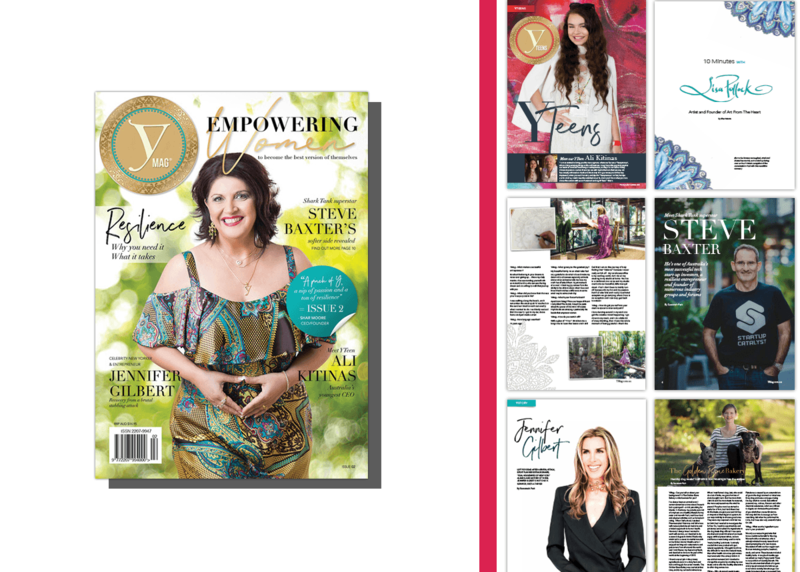 YMag is a luxe, beautiful, stylish magazine that makes you want to pour your favourite glass of Yine, or make a cuppa and curl up in your favourite chair and never leave home again. What do you think readers are going to love most about YMag? Our readers are falling in love with the ‘realness’ of YMag already. Real articles, about real people doing real things. No fluff, no hype and no celebrities and diets, or latest fads. Our readers are thanking us for providing a magazine that makes them feel inspired, worthy and enough just the way they are. I have so many, it really is hard to choose! This issue’s theme is about resilience and a few of the stories just simply amaze me. Human beings are incredibly strong when they need to be. I love Jennifer Gilbert’s story!! Imagine being stabbed 37 times and left for dead, to then fighting through that, staying in the same city and then becoming one of the largest event companies in New York! Or Steve Baxter, a shark on Australias Shark Tank. He exudes resilience and has done some incredible things in his life, despite not finishing school. I have so many more I could mention, but I’ll leave it there. What can readers expect from future issues of Ymag? Readers can expect the unexpected. YMag promises to always do what feels right at the time, with our readers enjoyment as our number one priority. We will never conform to typical styles or layouts and we will always create something that you will absolutely love. It’s going to be an amazing ride for our readers and we have so many exciting things planned for future issues! If Ymag had a motto what would it be? Be the best version of yourself, by finding and living your true purpose in life, your Y.